1) 2011 sub: calls him "Leorio" instead of "Leorio-san"
2) 2011 dub: calls him "Leorio" instead of "Mister Leorio"
3) 1999 sub: calls him "Leorio" instead of "Mr. Leorio"
This discussion takes place in episode 1 of 2011 and episode 3 of 1999. 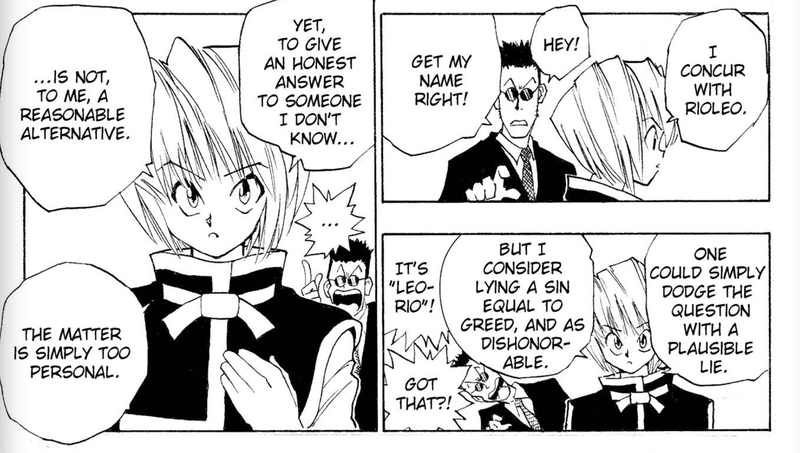 I'm pretty sure the disrespect is due to the way Leorio had been being rude to the Captain and Gon. Anyway, I'm most curious about #4. What exact name is Kurapika using? It is hard to tell with no text. Does the actual word mean anything in either English or Japanese? What exact name is Kurapika using? For me I hear Rioleo, which coincides with the official English translation of the manga. Does the actual word mean anything in either English or Japanese? I have not seen the original raws for the particular chapter or scene but the English does not mean anything since it just looks like two parts of his name switched in order (Leo-rio switched to Rio-leo) which was probably his way of showing disrespect by getting the name wrong.